So, it was all working fine, got Adapta theme installed and Numix Square. Did not remove or deleted any theme files. It was working all great. I decided to restart my laptop. Linux loaded the login screen perfectly. I enter my credentials and my taskbar or start menu does not load. I can launch apps that I have attached to my Docky bar below but, as you can see in the screenshot, the border of the window is not there. I cant close or minimize or move the window. Also, my mouse was DMZ-Black but that is now white themed as well. I am running Mint 18.3 Cinnamon x64. What happens if you revert to the default themes? I have yet to try that. I just found with Google how to launch the settings app, so when I get home I am trying to see if I can get the theme manager loaded so I can go back to the default theme. Curious though, would a theme that is borked, prevent the taskbar from loading? Now that I type this I guess it might since the taskbar and menu's are skinned off-course. You are right. All what get skinned by a theme can get borked by a theme. The panel belongs to it. Well, changing the theme did not work. Also tried restarting the desktop and off course a reboot. Create a fresh new user account for checking. I logged in with the guest account and that one is working fine. I did do a graphics upgrade driver wise but that had no luck. I also tried logging in in software rendering but that also didn't work. I read on the internet something about xserver-error or something. Where is that located? Maybe I can find some error messages there that tells me what is going wrong. If the guest account works we know, that the culprit is in your main account, not in the system. Poking there around will not help but gives the chance, to make things worse. For a first check we need to find out, if there are ownership problem. Log into the main account. A theme shouldn't be able to cause that issue. It looks like Cinnamon and muffin aren't running. You can always check the contents of ~/.xsession-errors to see if anything stands out. So somehow it seems something got unregistered or something? in the terminal to see if Cinnamon starts or what errors that shows. I have yet to reboot my laptop, but that fixed it! I can see my menu and taskbar again! Such a simple command to fix this problem. Never thought that would work. I was a bit too quick to jump the gun. When I close the terminal everything is gone again. Do I reboot to have it stick or? 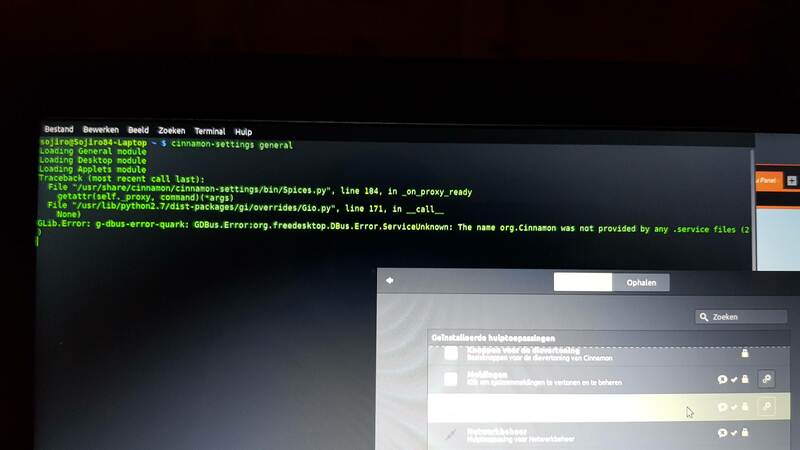 That would lead me to believe that something is not properly starting when you boot into cinnamon or something is causing it to crash. Please check .xsession-errors if you haven't. There are many errors concerning "caribou". [2545:2545:0311/103333.291778:ERROR:sandbox_linux.cc(375)] InitializeSandbox() called with multiple threads in process gpu-process. I did reinstall all cinnamin- packages there where on my system. It even had to download a few megs. Going to try and see if I can reboot. Reboot worked but still the same issue. 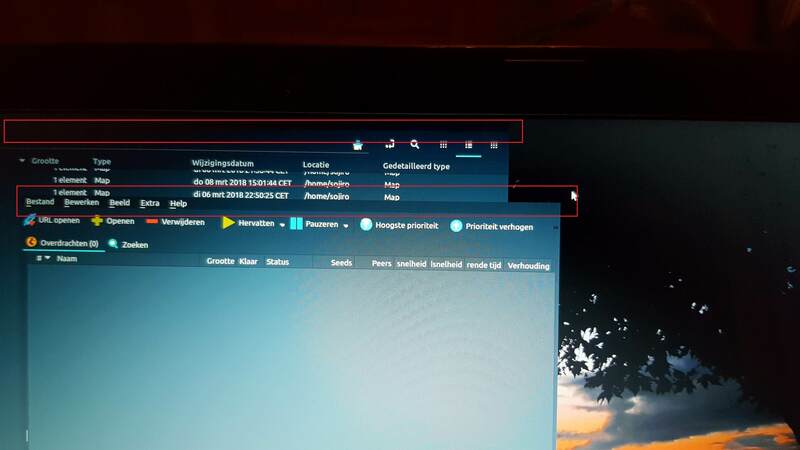 Atleast I can do the command to get a more working laptop but still strange that something at boot is messing things up, but what? Alright, since I also recently installed Mint on my desktop PC, and with the cinnamon replace command giving me a somewhat working Mint, I decided to compare settings with my desktop PC. I noticed that Cinnamon Settings Deamon - xrandr, wasn't there at startup apps, so I manually copied over the settings from my desktop pc. Anyway, any expert managed to look at the log? I really like this to be fixed. I also just noticed the software manager doesn't start. Synaptics does work luckily. Still, no permanent solution yet to my issue. Gotta love how easy it is with Linux to break a desktop. I logged in with the guest account and that one is working fine. That should not return results if all permissions in the home folder are correct. If you do get results post them. If not, you probably have a settings issue somewhere in your home folder.